Surely, Aspen, CO does not need any introduction, it is the ultimate sky paradise of the USA. 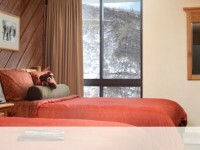 Metafares editor now found a great Aspen hotel deal on Bookit for you. But you have to hurry up, these rooms for hot rates are not only subject to sellout, but they also expire on January 13 – Friday, at Midnight. You can travel through May, 2012 and actually the end of May brings the best rates. So you get good prices for the high ski season and even better prices for the low season when there might not be snow, but the mountain landscapes are spectacular. We have found you some of the best rates available, check the table below with total prices. For the below rates you would get a Standard or Ridge View Room the latter with a view over the villages and mountain ridge opposite to the hotel – as the name would suggest – with two queen beds, wi-fi, sitting area, cable TV and other amenities. And how to book the hotel room for your winter holiday? Step 1.: Click a price and select Stonebridge Inn on Bookit’s deal page. Step 2.: Click show available dates and choose your check-in date. Step 3.: Follow the simple instructions to booking and enjoy your stay! *Total nightly rate per room includes all taxes and fees. This entry was posted on Wednesday, January 11th, 2012 at 9:34 am and is filed under Hotel Deals. You can follow any responses to this entry through the RSS 2.0 feed. You can leave a response, or trackback from your own site.